How can the ancient Chinese exercise of Tai-chi save the world? It transforms individuals, improving their health, eliminating stress, helps them let go of self destructive behaviors and feel more connected to their community. By transforming individual people in this way, the world can be transformed. Tai-chi strengthens each cell of the body. The movements promote the movement of intercellular fluid, which brings oxygen and nutrients to the cells and removes their waste. Without the type of intricate movement you get with Tai-chi, the cells receive little nutrients and oxygen, food is stored as fat and cellular waste is not removed. The cells metabolize poorly and degenerate quickly, which leads to early aging. Tai-chi prevents these problems. Tai-chi keeps the connective tissue flexible. This tissue surrounds all the organs, muscles body cavities and bones and forms ligaments and tendons. It tends to shrink and lose elasticity with age, which condenses the body. It is as if each part of the body is slowly being crushed. Tai-chi movements keep you young by keeping you flexible and maintaining full range of motion of the joints. You are also able to breathe more easily. The National Institutes of Health lists many research papers showing that Tai-chi helps with arthritis, Parkinson’s disease, heart disease and other conditions as well as improving balance. If we can be healthier as a society, then we will need less medical intervention and the cost of health care will be less. Our productivity will increase because we will be more energized and spend less time being sick. Our lives are becoming more disconnected. We interact through our cell phones and computers and less through face-to-face interaction. We don’t see our food being grown but purchase prepared, chemically enhanced, nutrient poor food, and just warm it up. We need body skills less and less, except for our thumbs for texting and so we live in our minds, considering our bodies to be “down there”. Our floors and streets are perfectly flat so we don’t even need to be mindful of how our feet interact with the ground. Tai-chi works by first connecting our minds and bodies. We become aware of how every muscle and joint works in an intricate and beautiful harmony. Our awareness is in every part of our bodies, not just in our heads. When we step, or breathe or smile, it is with full awareness and full participation of every part of us, connected and alive. When we speak with another person, we learn how to really listen, rather than just argue. The Push Hands exercise teaches us to be completely aware of what is going on inside of another person so that we understand their behavior. This allows us to be comfortable with them and appreciate their individual spirit. Can you imagine if everyone felt like this? We learn to move slowly and smoothly so that our attention flows like water. Rather than our minds ordering our bodies what to do, both mind and body flow together and work together. The mind doesn’t sit on its throne in the head. Each part of the body becomes conscious and consciously participates in the movements. This eliminates the master/slave relationship of the mind and body. It is said that the relationship between the mind and body is the basis of our relationships with other people. Isn’t it the mind, sitting on its throne, which argues that my way is right and yours is wrong? Yet that very mind has been filled with attitudes and behaviors from outside influences, with their own agendas. What we take to be our identity is to a large extent, pushed into us. It is as if we were forced to wear a suicide vest as we go through life. When we practice Push Hands we have to let go of these attitudes and programmed behaviors, because that is what our Push Hands partner uses to push us off balance. Instead, we have to resort to our creativity and sharpness of attention. We learn that many of our patterns of tension just set us up to get pushed and so we learn to let them go. Letting go is a large part of the training. We even let go of fear itself by examining what fear feels like and understanding that it is just a pattern of tension. What would the world be like if everyone could let go of self destructive behaviors? What if our identity was no longer based on our intellectual differences and fears but on realizing that the consciousness that flows inside of me is the same energy as that which flows inside of you? We may each be creative with that energy in a different way, but we are all “swimming in the same water” of consciousness. We learn this in Tai-chi. We even learn this lesson in Tai-chi-Chuan (the fighting training of this art). At the beginning we may see sparring as two opponents each trying to win. But the result of proper training in this martial art is to flow with the “opponent” so that there is only one flow. While there is action, your goal is to take control of the interaction so there is no opposition. You are always in a position of power but with no anger. This allows you to feel confident, yet not aggressive, not only in sparring, but in any interaction in everyday life. You are no longer battling your way through life as if you were always on the outside of it. Creativity takes the place of battling. We say that we cannot take control of the sparring partner’s body – only his mind. If your mind is free and creative, as it is through Tai-chi training, it can never be trapped. As an example, if someone is grabbed, they usually tense up. This just makes it easier for the grabber to control his victim. But if you are loose you can easily slip out of the grab. And so sparring teaches you how to avoid getting trapped in life. While most people do not learn the martial aspect of Tai-chi training, each part of the training teaches all the principles. You can learn slow forms (movements), aerobic forms, chi-gung (simple exercises), Push Hands – just learning as much as you like. You can also learn healing (Tai-chi Body-work). There is something for everyone in this system of exercise and healing. 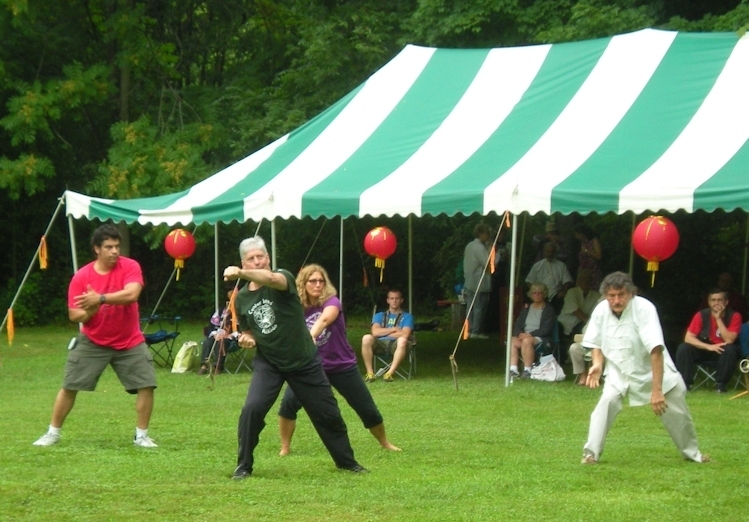 There are several types of healing that are connected with Tai-chi practice such as acupuncture, acupressure, Tai-chi Bodywork, herbal medicine and more. This type of healing is based on the idea that the body is an ecological community of many types of cells and organs that work best when kept in balance. There is a biological energy that flows through the body called “chi”. When chi flows evenly through every cell and organ of the body, the body is in the best health. The healing principle “The inside and outside reflect each other” means that we are part of the ecology of the planet. When we heal ourselves we are healing part of the planet. Since each part of the planet is connected to each other part, healing our self really helps to heal the whole living planet. Tai-chi helps to heal the “chi” that flows through all of us and through all living things, heals the relationships among people and heals us as individuals. What would happen if everyone did Tai-chi? When we were little we found joy in movement, singing and in other simple things. We don’t do much of that anymore. Tai-chi reminds us how simple movements can bring the feeling of joy back into our lives. Some types of chi-gung are based on the movements of animals and are great fun (“Zookinesis” is one such series of animal exercises). By eliminating habits of tension and worry and making each part of the body more aware and sensitive, Tai chi allows us to experience more joy. We can feel the beautiful things around us – art, nature and the human spirit – more intensely. The movements of Tai-chi are an art that weaves the beauty of our biological nature and human spirit into a life of joy that can be shared. We learn to become connected to the earth, to other people, to our own spirit and body and to a great history of teachers who passed this training down through thousands of years. While originating in China, Tai-chi is not just about one kind of people or one religion or one political party. It is about how we are all part of the same consciousness and the same system of nature. It is about becoming healthy and comfortable with the great variety of life. It is about letting go of the fear that holds us back from joy. What would it be like if everyone did Tai-chi?